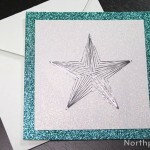 This card has a subtle amount of dimension; instead of adding designs on top of the card, the tree is recessed. To achieve this effect, we used chipboard, scrapbook paper, and cardstock. Keep reading to find out how to make it! Print the template and cut out. Set aside. Working over the cutting mat, measure and cut chipboard so that it is 4" x 6". Measure and cut a 4" x 6" piece of scrapbook paper. Using rubber cement, glue scrapbook paper to chipboard. Let dry completely. Note: If you try to cut the paper/chipboard before the glue is dry, you may end up tearing the paper. Place tree template in the center of scrapbook paper/chipboard. Lightly trace the tree, and then cut out using the X-Acto. Measure and cut an 8" x 6" piece of green cardstock. Fold in half, forming a 4" x 6" card. On the back of chipboard, apply rubber cement, and then press onto the front of green card. Allow rubber cement to dry. Enjoy this recessed tree design, and write your Christmas greeting wherever you like! This card will fit in an A4 envelope, and you can find A4 envelopes like these at envelopes.com.